Ralph Lauren started his eponymous brand more than 50 years ago with a men’s tie line. Inspired by sports, he named his very first collection ‘Polo’ and since became known for his polo shirts. However, many years have passed since then and, today, Ralph Lauren is much more than a somewhat preppy polo shirt. Over the years, Ralph Lauren has also become known for his take on American sportswear that always offers style with comfort. Ralph Lauren’s 2018 Prefall collection is rather intriguing. It offered a little bit of everything and takes you on quite the journey. The collection is sleek and elegant, it is minimal yet striking and elegant. The colour palette was kept simple with grey and brown tones ranging from metallic to mat. Several looks stood out such as the champagne coloured sleek dress with low back and the metallic grey dress, they were cleverly understated, elegant and would make an impact at the right occasions. Other stand out pieces were the coats and jackets, in general the suiting was brilliantly executed with several exquisite androgynous suits, jackets and coats, especially the navy shawl tuxedo blazer with casual pants stood out. The pantsuits ranged from classic to contemporary with references to American workwear. A metallic flight suit stood out as did a brown pantsuit with wide legs styled with a cute brown bag. 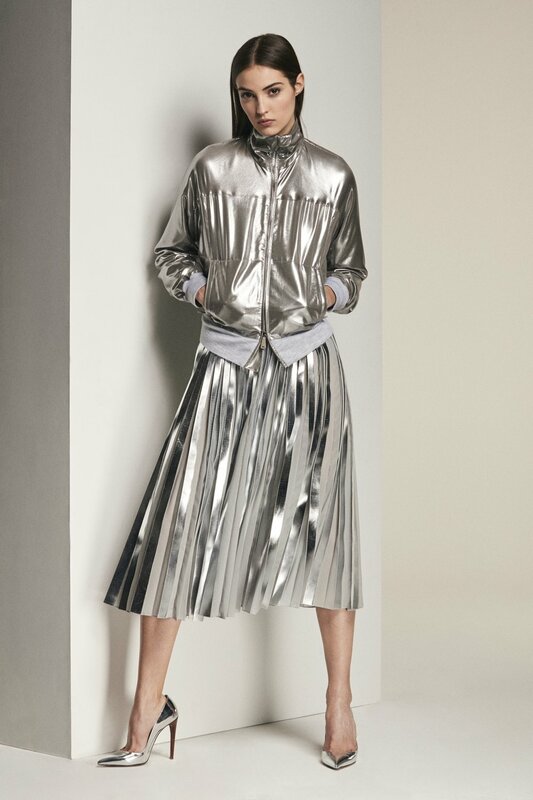 A metallic bomber jacket along with a furry and metallic blush flight suit kept the collection contemporary and youthful. Looking at the 2018 Prefall collection, one might wonder where the comfort of Ralph Lauren has gone. But do not despair, Ralph Lauren know his strong following and know they value comfort as much as style and elegance and thus the adorable lurex sweaters and pleated skirts come with a soft cashmere lining. Ralph Lauren has created an intriguing and exciting 2018 Prefall Collection with pieces for any fashionista with a preference for the comfortable.